Setting out to find a career is an exciting, yet terrifying time in everyone’s life. It’s easy to wonder – am I choosing the right path? What if I end up not liking the job? Am I wasting my time? All of these questions are completely legitimate, but having a mentor to turn to for advice and guidance can make the journey less terrifying. When we look back on when we first embarked on our career paths, there is usually a special someone who helped shape our careers by sharing their knowledge and past experiences. While it is said that struggles prove to be one of life’s greatest teachers, a mentor can help guide you through those struggles. We’ve always taken mentoring very seriously. In fact, we encourage our staffs’ children and close family friends to shadow our employees if they show an interest in nursing, physical or occupational therapy or administration. As a locally-owned and managed facility, we can offer an exceptional learning environment with hands-on experience. We have employees that started as CNAs that are now RNs, nursing station secretaries that have gone on to nursing school and students from Blue Hills Technical School who have finished their technical hours at our facility. Jill Owens is the MDS Coordinator here at Copley. As an MDS Coordinator, Jill’s daily tasks consist of assessing the quality of the emotional, mental and physical care that is given to long-term patients. She started as a CNA back in 1995 and has since worked her way through nursing school and up to a management position that is very important for the everyday function of our facility, staff, and patients. We open our doors and not only welcome but encourage younger generations to use our facility and our well-trained staff as a source of knowledge for their future. Know someone looking for hands-on experience in nursing or any part of the skilled nursing field? We would love to hear from them and learn how we can work together to start them on their way to a rewarding career. Whether it is through volunteering, interning or finishing up technical hours, there are many opportunities to learn and grow in any field if you put yourself out there! The holiday season is without a doubt my favorite time of year to reflect on how wonderful it is to be part of this community. From holiday parties and shopping to religious services, and our annual Holiday Open House, I know that there will be many opportunities for me to see people I have known for years and remember those who have passed on. Having the chance to work in the town where I grew up and raised my family gives me the chance to assist numerous people that I know personally- some since elementary school. Because we are locally owned and operated, the majority of our Copley employees also reside in the surrounding area. Almost all of our residents and guests here know someone on our staff through a personal connection. 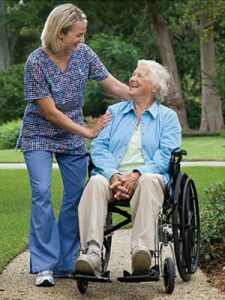 Our ability to provide services with a personal touch is not something many Skilled Nursing Facilities can say they do. Even if you don’t need our services at present, feel free to stop by for a tour or give us a call to connect. And, if you are interested in working in a supportive environment that values community, I’d love to hear from you. Chances are you probably know one or more of our residents or a member of our staff. Give us a call at 781-341-2300 X119 or check us out on Indeed to learn more about our open positions. It’s hard to believe that I have been here for seven years now. I’ve come to realize that it’s true what they say- if you enjoy what you do and most importantly who you work with the time flies. I am always looking to grow my ties within this community; I hope to hear from you soon! As we approach the holidays, we begin to reflect on how thankful we are and how much we appreciate those around us. Here at Copley, this time of year brings us many opportunities to show our staff how grateful we are for them. Not that their efforts ever go unnoticed, but the holiday season gives us the chance to slow down and let them know how valued they are. Our Employee Appreciation Awards took place on November 9th; we had the opportunity to take a break from our hectic routines to enjoy each other’s company over lunch while we recognized our employees. We kicked off the awards acknowledging those with perfect attendance. We are always amazed by the number of staff members we have here with perfect attendance, it really speaks to their dedication! Next, we honor those who have been here for two, five, ten and twenty years. Each year we see more and more repeat faces filling our annual awards, and it gives us a great deal of pride to know that we are doing something correctly to keep our team around. It brings us joy to hear comments throughout the community about our dedicated team of professionals because if it weren’t for them, it would be impossible for us to operate as we do. 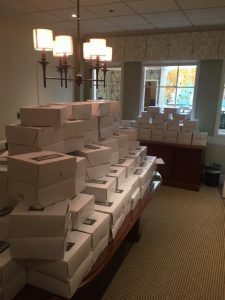 Another annual event we look forward to is the Thanksgiving pie delivery that fills our conference room with fresh apple pies from Whitey’s bakery. Each staff member is able to take one home to enjoy with their loved ones on Thanksgiving. As we head into December we begin to organize our Giving Tree. Each staff member gets to pick an envelope off of the tree and receive a mystery gift card. This is such a great way to end the year and show our appreciation. On December 14th we will be hosting our annual Holiday Reception from 5:30PM – 8:00PM for our residents, guests, staff and families. Wishing a warm holiday season filled with rest and relaxation to you and your loved ones! Rehabilitation is a vital part of the recovery process after any post-acute stay. It improves functional mobility, average daily living skills (ADLs), as well as speech and swallowing disorders. Sometimes an inpatient stay at a skilled nursing facility, such as Copley, is required to facilitate your rehab goals. 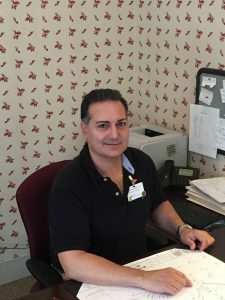 Denis Andreotti, our Director of Rehab Services, is a native of Norwood, MA with strong ties in the Canton community, as his family owned and operated Andreotti Pharmacy for many years. Denis holds a Masters in Physical Therapy from the MGH Institute of Health Professions and has been with Copley for over seven years now. He enjoys the fact that all of his staff works for Copley (many skilled nursing facilities sub-contract therapy to a third party) and the freedom he has to manage his department in an effective way. He coordinates and operates the services of the department to ensure that Copley guests reach their maximum potential to live as independent a life as possible, while returning home as quickly as possible. 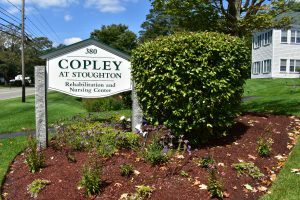 Copley at Stoughton’s Rehabilitation Department is a total in-house operation and offers separate physical and occupational areas that are equipped to deal with a range of conditions resulting from elective orthopedic procedures, injury or debilitating acute/chronic illnesses. All of our therapists are staff members who get to know each and every guest under their care. Doctors often recommend post-acute care facilities to patients but it is important to remember that if you have Medicare benefits then where you go for therapy is up to you! It is YOUR CHOICE to pick a place you feel is the best fit and more importantly convenient for you and your family. If you are having an elective surgery and are pre-booking your post-acute stay, make sure that you do your research and pick the best place that fits your needs. Denis welcomes guests to stop by and chat with him before their procedures to make sure Copley is a good match for your needs, and explain what to expect during a rehabilitation stay. Activity Directors at Skilled Nursing Facilities play a vital role in developing and implementing different activities that will engage residents, give them something to look forward to and encourage socialization. Cheryl Woodward has been our Activities Director for ten years now, planning and implementing the daily and annual activities for our residents. Cheryl lives locally in Taunton, MA and in her free time enjoys painting, decorating, arts and crafts and anything that gets her creative juices flowing. Cheryl works hard to reconnect our residents with the hobbies they love to make their lives feel fulfilled and meaningful. Each month a thoughtfully planned calendar outlining activities gives residents something to look forward to, which helps tremendously with their mental well-being. There are also many events that occur on a regular basis including coffee hour & word games to keep residents minds sharp, fitness fun to encourage an active lifestyle, painting classes for artistic residents, spa days, restaurant outings, casino trips and more! Cheryl’s favorite activities to plan are the ones that involve bringing the resident’s families together. Some of the annual family events are the Winter Holiday Celebration in December and National Nursing Home Week in May. 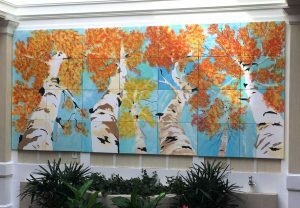 Each season, our residents work collectively on a mural that graces the front lobby of Copley. Each resident participating is given one to two squares of a larger picture to complete. 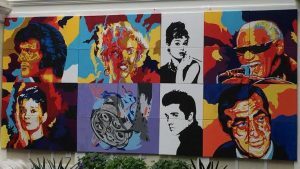 The individual paintings are then put together and revealed to the residents in a grand unveiling ceremony. This is one of the most looked forward to events each season as it takes hours of hard work and dedication. Cheryl started incorporating these murals into our activities three years ago, and past and present residents have now completed twelve collaborative murals, and we recently started donating the older ones to town buildings. 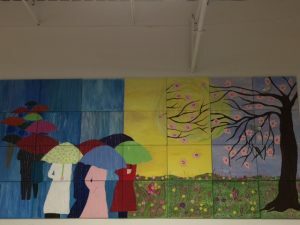 Our spring 2015 mural entitled “April Showers Bring May Flowers” is on display at the Stoughton Public Library. Be sure to check it out if you are in the area. Cheryl enjoys working here for many reasons but said that what she appreciates most about her job is how it feels like home. It is not only a comfortable environment, but she loves the people she works alongside and the special bond she has with our residents. There are many unflattering stigmas associated with skilled nursing facilities (SNFs). So for this month’s blog, we want to take the opportunity to dispel some of these “un-truths” and shine some light on the realities of being a guest or resident at Copley at Stoughton. 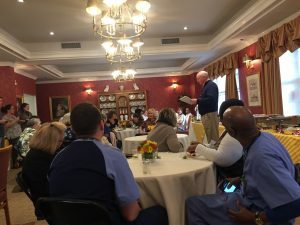 Proper nutrition is one of the main concerns of staff members at a skilled nursing facility, especially here at Copley. It is crucial to provide residents with proper nutrition to keep them healthy and feeling their best. Our registered dietitian Deb and head chef Bobbi Jo work hard to make sure each specialized diet plan is providing residents with the proper nutrients to make sure their dietary needs are being met. We must go above and beyond to make sure all guests and residents enjoy our menus. A few of our favorite dishes here at Copley are the pan seared scallops over baby greens, the complete Thanksgiving turkey dinner and the daily breakfasts served in the dining room. We also strive to make every attempt to fulfill individual requests at each meal. This myth is commonly associated with the fact that some older adults are incontinent due to medical issues. Properly cleaned facilities like Copley not only use highly effective products to avoid odors from building up, but also have trained staff members who thoroughly cleanse residents before odors become an issue. Of course, there will be odors in areas where we care for residents at certain times, but those odors should never affect the lobby or common areas. There is no denying that we LOVE Bingo here at Copley and fit it into our schedules numerous times each week, but we do more than just Bingo. All skilled nursing facilities have activity directors on site to plan various activities on a daily basis that are mentally, physically and socially stimulating. 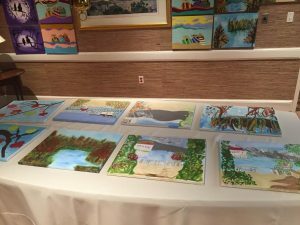 We get our residents involved in seasonal murals, weekly art classes, a yearly harbor cruise, live musical performances, group story writing, restaurant and casino outings and much more! Transitioning into a new living situation can be difficult for anyone, regardless of their age. Adjusting is something that takes time, sometimes up to 6 months to even a year. By transitioning, we mean residents being fully engaged in activities, the dining room, and facility outings. Residents often meet many people during their stay with common interests, allowing them to bond and form friendships with one another. We are very aware of this transition process with new residents and make sure that we do everything in our power to make the process easier for them. We also like to encourage families to visit whenever they can to bring a sense of familiarity to their loved ones as long as they’re not interfering with the care of other residents. We also encourage all resident to bring some personal items to make it feel more like their home. Summer is finally here, and as much as we welcome the sun, it is important to remember that the older you get, the more sensitive your skin becomes to harmful UV rays. Each time our residents are outside, regardless of the amount of time they will be spending in the sun, we make sure that our nurses protect their skin with sunscreen. Protection with a SPF 15 or higher on a daily basis can dramatically decrease skin aging. According to the Skin Cancer Foundation, the older you get, the higher your risk becomes for skin cancer, and if you’ve had more than five sunburns in your lifetime, your risk of melanoma doubles. Apply SPF 15 or higher on a daily basis, especially to your face, whether you are going to the beach or just to work! Learn more about what your sunscreen label is actually saying HERE. Consider investing in clothing with SPF! It is a great way to further protect your skin from those harmful UV rays. Check out some SPF clothing HERE. Seek shade! UV rays are the most harmful between 10AM and 4PM. Wear sunglasses. Good sunglasses with UV-blocking properties are a necessity when it comes to protecting the sensitive skin around your eyes as well as your eyes in general! Avoid tanning beds at ALL COSTS. They have been linked with increased risks of melanoma. A is for Asymmetry: One half of a mole or birthmark does not match the other. B is for Border: The edges are irregular, ragged, notched, or blurred. C is for Color: The color is not the same all over and may include shades of brown or black, or sometimes with patches of pink, red, white, or blue. D is for Diameter: The spot is larger than 6 millimeters across (about ¼ inch – the size of a pencil eraser), although melanomas can sometimes be smaller than this. E is for Evolving: The mole is changing in size, shape, or color. There is plenty of information on the hazards of UV rays and the risks of skin cancer/sun damage, but it is not all doom and gloom, if you are proactive with protection. And remember, you are susceptible to harmful UV rays 12 months of the year, not just in the summer months. Outsourcing key ancillary departments by healthcare providers is a common practice. Housekeeping, laundry, and rehab staffs are frequently outsourced, dietary services also, but to a lesser extent. Providers may at times have no other choice but to outsource due to inability to attract a qualified staff or simply view it as an expense reducing strategy. I have found that at Copley it is best to keep all services in house. It is not worth the loss of the direct managerial control if we were to contract our services. In the long run, the increase in referrals we see by staying focused on our commitment (as a healthcare provider and employer) to our community far outweighs any expense reduction we will see in the short term. By keeping everything in-house here at Copley, we allow our management team to maintain complete control of the services being provided to our residents and guests. For example; if we outsourced our dietary department it would be cost prohibitive to have the main dining serve three meals per day in the manner in which we do individual plate service. Our excellent rehab staff can focus on schedules that are optimal for our guests and not simply focus on inflated efficiency expectations which would be a major factor if outsourced. Without our highly-skilled staff, their individual talents and our direct management, the quality of our care would not remain at the standard we expect. We pride ourselves on the “local” aspect of our facility, and as a Stoughton resident, I work hard to keeps things local, including hiring people from the local community and surrounding towns. Our Admissions Director, Chris Simonson, as well as our Director of Social Services, Laurie Jameson, are both from Easton. Dennis Andreotti, our Director of Rehab Services, is from Canton. The majority of our Certified Nursing Assistants are from Stoughton or a neighboring town. Having a staff of trained professional from the same towns that our residents/guests are from and keeping our services in-house creates a motivation factor in our facility to not let our neighbor down! In past blog posts, we have briefly touched upon the CHOICE you have when it comes to finding a post-acute care provider or skilled nursing facility (SNF) that is suitable for a loved one or you. Staying informed and knowing what you are looking for makes the process much easier. We, more than anyone, hope that you never have to use a SNF in your lifetime, but you should prepare for instances down the road where you may need one. With life’s unexpected accidents and people living longer, it is important to look at all your SNF options in advance. You NEVER want to settle for somewhere you do not feel comfortable, and in a moment of panic, it is easy to be swayed to make a decision based off of urgency and convenience. Start your research early on by asking around about other people’s experiences with skilled nursing facilities in the area. More likely than not, someone you already know has had to utilize the professional services of a SNF for themselves or a loved one. These first hand experiences will be great resources as you start to look into your SNF options. Once you have a solid list of reputable facilities, the next step is to start setting up tours. 1) The Residents- Do they seem happy and content? The way the residents feel is a great indication of the care they are receiving. 2) Are your questions being answered? A skilled nursing facility that has nothing to hide will be transparent and responsive about your questions and concerns. 3) Who made time to speak with you? If the admissions director or facility administrator didn’t make time for you, who did? It is important you do not feel ignored or rushed out the door because they have more important things going on. 4) The Overall Vibe- Once you pay attention to these aspects during your tour, you’re going to be left with an overall “vibe” of the facility. As you are leaving, ask yourself if you would feel comfortable admitting a loved one to recuperate there based off of everything you just saw. Once you decide which SNF best meets your needs, remember that the process does not end there. Throughout your entire time at a SNF, it is crucial to speak up and have all of your concerns dealt with. Speaking up about something that is wrong or makes you uncomfortable is an important way to prevent future problems and maintain your happiness. A reputable SNF will always encourage and solicit your feedback. March is National Women’s History Month, a time when we collectively honor women who have made a significant difference in our lives. Here at Copley at Stoughton, we have some amazing women who are dedicated to improving the quality of care and life for our residents’ day in and day out. Chris Simonson, the Admissions Director here at Copley at Stoughton, has now been a dedicated staff member for over twenty years! Chris makes the nursing home transition process for residents and their families a much sweeter experience. Chris lives locally in Easton and is a firm believer that the care you receive at a local, private home, operated by local professionals is incomparable to larger, corporate facilities. She feels fortunate to have a job that makes her feel like she is giving back to her community each and every day. Deb Moriarty brings a wealth of knowledge to Copley at Stoughton as our Dietitian. Deb works closely with our head chef Bobbi Jo Thatcher; to create over 40 specialized diet plans for our residents, which we spoke briefly about in a post a few months back. They both take on the job of making sure patients are receiving the proper nutrients they need on a day-to-day basis. Some of our residents have special dietary plans based on their health needs, and these women ensure that each and every person receives the proper nutrients in order to thrive. Bobbi is also responsible for creating the menus and ordering all of the food, while still always keeping the kitchen running smoothly every day. From Lakeville and Wareham respectively, we are lucky to have Deb and Bobbi as part of the Copley team. Cheryl Woodward, the Activities Director here at Copley at Stoughton, is from the town of Taunton. Cheryl dedicates her time not only to making sure she has a full calendar of activities for the residents each month, but she also plans and executes each event. From beautiful pumpkin centerpieces at Thanksgiving, to breathtaking lights and decorations during the holidays, we can always count on Cheryl for keeping our residents spirits high. 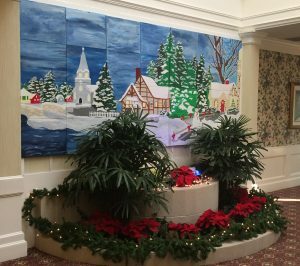 Two of the most anticipated events at Copley at Stoughton, both coordinated by Cheryl, are the seasonal mural reveals and our Annual Winter Holiday Celebration. 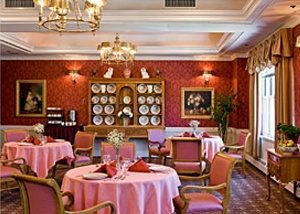 Live music, trips to local restaurants, parties/celebrations for almost every occasion, religious meetings for all walks of life, trips to the salon, card games, visiting authors, fitness fun and coffee hours are just a few of the other activities our residents can look forward to on a regular basis. Cheryl works hard to reconnect residents with the hobbies that they love, to make their lives feel fulfilled and meaningful. A thoughtfully planned activities calendar each month, gives residents something to look forward to socially, which is crucial for one’s mental being! Most of the dedicated CNAs here at Copley at Stoughton come from all walks of life and from all over the world. Many have come from different countries and settled in the Stoughton area to raise their families and find careers. Being a CNA is a difficult job, but these women have dedicated their lives to this challenging career to further their possibilities. Copley has an enormous amount of pride for these women and their immense amounts of strength to raise families, further their education, and learn new languages all to make better lives for their loved ones, truly remarkable. 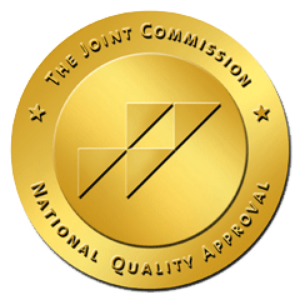 Accredited by The Joint Commission as a skilled Nursing and Rehabilitation Center .